Our stories are all around us. Most of us don’t realize we are telling a story as we live our lives. They are written in how we treat each other, our children, our neighbors, and ourselves. The “greatest story ever told” is told most of the time in that same manner. “They will know we are Christians by our Love for each other”. 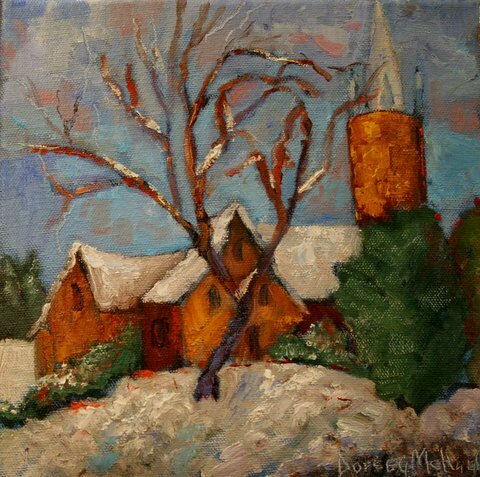 In my paintings, these little buildings with steeples, tell a story of redemption. Their purpose is to tell us the seriously amazing good news of being created and loved by THE master artist. It is Love worth celebrating! It is a message which takes all our burdens away. Because of this, we are free to tell our stories honestly, and we can have the liberty to be exactly who we are in them. It is joyful to give away what we are receiving. It is reason to celebrate. Let’s have a party!